Our AbrasiveSoft Hand pads can replace your traditional sponges, because the traditional sponges typically collect bacteria and often have to be thrown away after single use. Our Abrasive Hand Pads can be washed many times so you don’t have to throw them away. 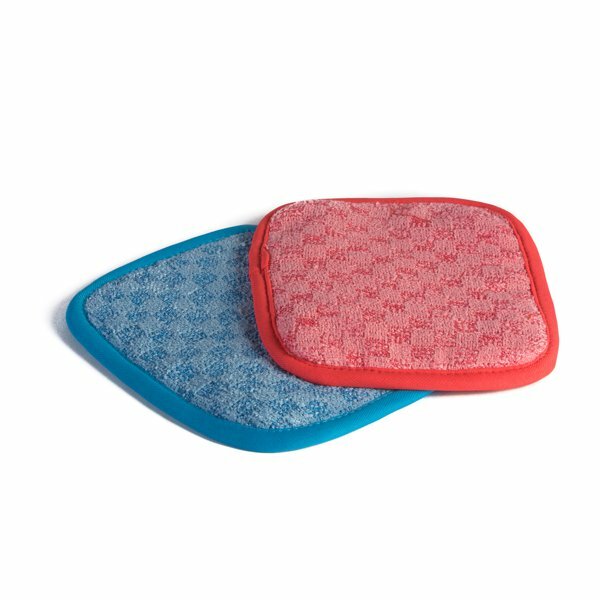 In a nutshell, these pads will make your cleaning routines more effortless and economic. With all those benefits you won't have to worry about any trade-offs: The pads won't negatively affect your chrome and mirror surfaces, so they are especially good when used for hard top surfaces (eg. sinks, taps, toilet bath, glass) for hygienic results. Hard top, ceramic and glass surfaces for best hygienic cleaning results. Suitable for cleaning toilets, baths, showers and sink facilities in healthcare, nurseries, schools, universities, offices, public buildings, food industry, hospitality and residential areas. Also suitable for use in sports facilities for cleaning locker rooms. Use as an alternative to abrasive sponges. Using a 6 liter bucket or box with lid. Place the cloths in the bucket/box. Pour over the designated fluid. Cover with a lid and leave until cloths have charged. If spray bottles are in use apply a few squirts of liquid to the surface and use a dry hand pad. We recommend that the nozzle is set to jet spray. Alternatively the hand pads can be charged in a washing machine by adapting the final spin cycle. Depending on surface circumstances, charge the pads with 5-50 ml per pad. - low water level during processing or overloading washing machine (max a. 80% of door window) may cause irreversible damage to hand pads. Rekola Reflex AbrasiveSoft Hand pads are made purely of synthetic materials. It can be used in recycling programs; alternatively because of their high energy value and zero emissions other than water and CO2 they can be safely disposed of by use of controlled energy-supply programs.